In addition to Acadia's beautiful hiking trails, there are also over 45 miles of carriage roads built by millionaire philanthropist John D. Rockefeller Jr. between 1913 and 1940. 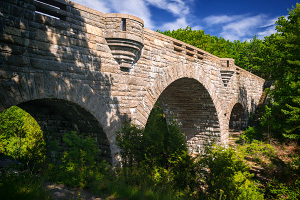 Originally conceived as a way to give city folk an escape to the natural world, the carriage road system wanders through some of the best forested and lakeside scenery and is enjoyed by bikers, hikers, and horseback and horse-drawn carriage riders alike. 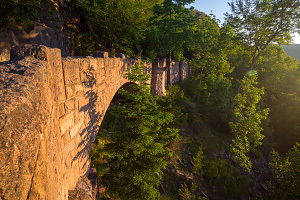 Rockefeller also financed, designed, and supervised the construction of 16 majestic stone bridges that were built at several stream and gorge crossings throughout the carriage road system. Since each bridge is a unique work of art, it is fun to try to visit them all! Below is the list of Rockefeller's "Classic 16." Click on a bridge name for more detailed information, maps, and photos. 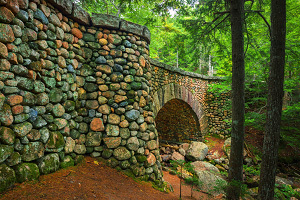 Duck Brook Bridge 1929 Located along the Witch Hole Pond carriage road loop near the Hulls Cove Visitor Center, Duck Brook Bridge is the tallest and arguably the most grandiose and ornate stone bridge in Acadia, with three large arches and four turret-style viewing platforms at the top. Eagle Lake Bridge 1928 A popular spot for people to start their carriage road bike rides is the parking lot at the north shore of Eagle Lake. 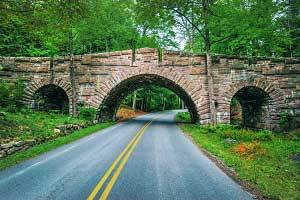 Eagle Lake Bridge supports drivers on Route 233 and the large tunnel-like arch welcomes visitors to the beautiful carriage-road system surrounding Eagle Lake. Jordan Pond Bridge 1920 Also known as the "Jordan Pond Dam Bridge" because of its proximity to the outtake dam at the south end of Jordan Pond, the Jordan Pond Bridge is a small and often unnoticed bridge that leads visitors away from the Jordan Pond House to start exploring the carriage roads. Cobblestone Bridge 1917 Located south of the Jordan Pond House along the picturesque Jordan Stream, Cobblestone Bridge is the oldest of the Rockefeller carriage-road bridges and it is the only bridge constructed completely of cobblestones, making it a unique destination for sightseers. 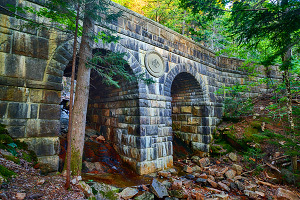 Deer Brook Bridge 1925 Located near the northwest corner of Jordan Pond where Around-Mountain Carriage Road intersects with the Deer Brook Trail, this elegant two-arch bridge was constructed with dark-stained granite and looks like something you would find in New York City. Hemlock Bridge 1924 One of the more expensive bridges to build, this majestic bridge is located under Bald Peak and Sargent Mountain and spans an impressive 200 feet with a single arch surrounded by two faux arches. Waterfall Bridge 1925 Located a stone's throw east of Hemlock Bridge, this is another classic and majestic bridge that overlooks 40-ft tall Hadlock Falls. 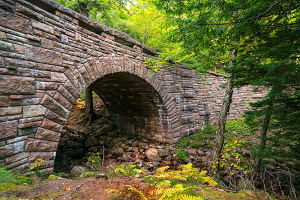 The bridge's skewed arch frames the waterfall and is an iconic Acadia photo op. Four buttress-like viewing platforms encourage visitors to enjoy the scenery. Hadlock Brook Bridge 1926 Similar in design to the Little Harbor Brook Bridge and the Jordan Pond Dam Bridge, the elegant little Hadlock Brook Bridge is located along the Upper Hadlock Pond carriage road loop. Amphitheater Bridge 1931 Located in the valley between Cedar Swamp Mountain and Penobscot Mountain, this is one of the longest bridges made of precisely-cut and placed pink granite slabs. The patterns of raised pieces along with the open spaces under the top railing make this a work of art. Little Harbor Brook Bridge 1919 This modest yet elegant little carriage-road bridge is the second oldest in the park and is located almost a mile downstream from the Amphitheater Bridge. Constructed of dark stained rock, this is one of the more remote bridges. Cliffside Bridge 1932 One of the last bridges to be completed, Cliffside Bridge was constructed for the Around-Mountain carriage road to traverse a section of steep cliffs under Penobscot Mountain. Built in the style of an English castle, this bridge is also the longest and it offers wonderful views of the surrounding area. West Branch Bridge 1931 Despite being 115 feet in length, this is a somewhat understated bridge located just west of junction 14 near the Jordan Pond House. A single narrow arch stands above the usually dry streambed. Bubble Pond Bridge 1928 This medium-sized bridge is located just next to the Bubble Pond parking lot on the north side of Bubble Pond. Chasm Brook Bridge 1926 Chasm Brook Bridge is probably the most remote bridge in the carriage road system. This fairly modest and understated bridge is located along the isolated northern loop of Around-Mountain Carriage Road on the north face of Sargent Mountain, stretching over the small Chasm Brook gorge. Stanley Brook Bridge 1933 As the last of Rockefeller's classic carriage road bridges to be built, Stanley Brook Bridge is also one of the most magnificent, welcoming drivers from the Stanley Brook Entrance near the town of Seal Harbor into Acadia National Park. 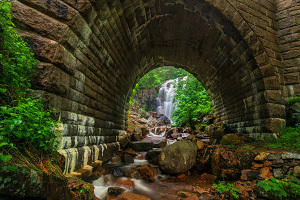 The three arches allow traffic, a hiking trail, and the brook to travel underneath. Jordan Pond Road Bridge 1932 Also known as the "Jordan Pond Seal Harbor Bridge," this bridge is located only a tenth of a mile east of the Stanley Brook Bridge and allows the carriage road to go under Jordan Pond Road, a local road that heads into the residential part of Seal Harbor.